One of the greatest sources of social media FOMO (fear of missing out) in the LUX offices currently emanates from the unlikely source of tourist office Instagram feeds. Normally, these are full of the usual platitudes about activities for all the family and new dine-around packages, and adorned with images of improbably physically superhuman and beautiful families gazing out over vistas in perfectly styled hiking gear. But this has been a near-record-breaking winter for snowfall in the Alps. The same bands of cloud sweeping in from the Atlantic that have caused floods in Paris and anxiety in France have dropped their load as snow as they hit higher altitudes. Many resorts have had more snow than they know what to do with, literally in some cases, as poor Zermatt, ringed by some of the highest Alps, was cut off from the world a couple of times. While you wouldn’t wish to be skiing during a snowstorm, the weather has calmed down now, and those resort Instagrams are brimming with images of deep snow, chalets peeking out from drifts, silver woodlands, vistas of powder. The fact that the biggest snowfalls happened after the peak Christmas season means there is plenty of fresh stuff around still, also. 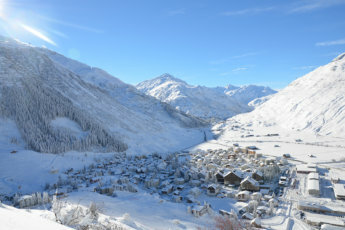 A ski trip in the next few weeks seems inevitable, but LUX is not tempted by the fleshpots of Courchevel or Verbier. Instead, we are thinking of heading to our favourite, semi-secret hotel in the Alps. A place that does no self-publicising, doesn’t market itself to a market of billionaires, is not interested in whether you are a celebrity (A list or Z list), has no ski-in-ski-out facilities, and yet is, quite possibly, the most entrancing destination we have discovered. The Waldhaus, Sils, sits on a rock above the tiny but culturally significant village of Sils-Maria near the head of a broad, high, sunny valley in southeast Switzerland. Sils-Maria was the home of Friedrich Nietzsche, and it has been a gathering point of the European cultural aristocracy for more than a century: Hermann Hesse, Thomas Mann, Marc Chagall and Gerhard Richter have all visited for inspiration. Views from the Waldhaus stretch south, along Lake Sils, frozen in winter and surrounded by forest, and north, past St Moritz (just 10 minutes away) and along either side of the Engadine valley. The Waldhaus is a family-run hotel that has an other-worldly feeling of design harmony: not ultra-contemporary, not classic, but a perfectly curated collection of modern 20th century design. It’s there in the details – the chairs, the tables, the wood flooring, the lights – above all, the lights – and also in the fundamental layout: a window view from a reading room that looks like a perfectly framed Thomas Ruff image; the way the staircase is lit, and the stair rails designed; the way the keys hang at reception. There is nowhere we have found that has this encompassing, and inspiring, depth of modern-classic design beauty: the Waldhaus Sils has not been consciously designed, just put together and maintained by its family owners. There is everything you would expect from a five-star Swiss hotel, including excellent, not over-fussy, cuisine; an indoor pool; and a service to take you to and from all the ski lifts of the St Moritz area to enjoy that snow. But we will be just as happy walking down through the snowdrifts to the wooded promontory on Lake Sils where the Romantic poets took inspiration, or to drink a hot chocolate laced with rum next to Nietzsche’s house in Sils itself. And walking back up to the hotel, crunching deeply through the white, and reflecting that the Waldhaus and its aura will still be with us long after the greatest literary figures of the 21st century have come and gone.